We wanted to take spectra of refinery flares from a distance. It has been discussed over the spectrometry list, as well as in the distance research notes. At our last gathering, we discussed security considerations and tried to sight the flare from blocks away. 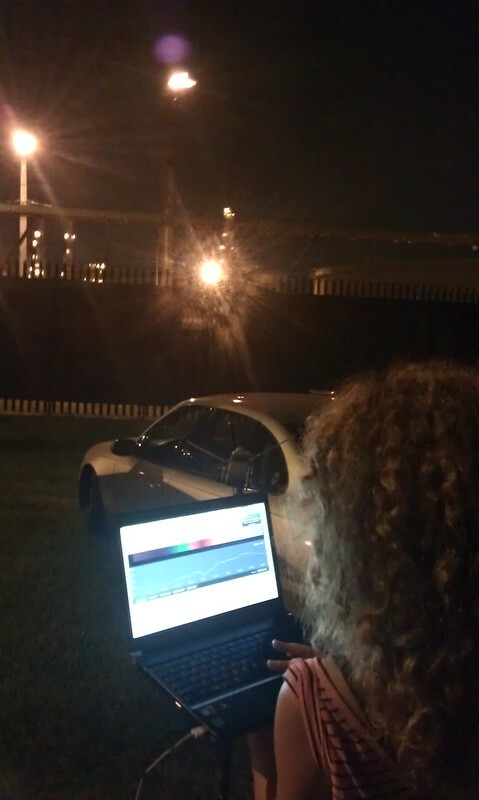 It was decided that nighttime was best, both for contrast, and for syncing our measurements with the refineries' timing--anedotally, there is more flaring at night. We got a shot of the sky. 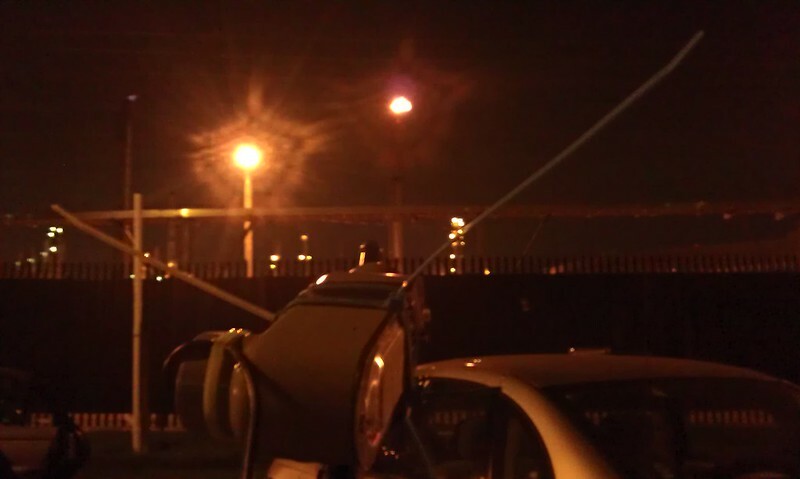 Green Zip Tie Spectrometer, with slit, pointed at the afternoon sky in Chalmette. We removed the black cardboard from Scott's very rudimentary desktop spectrometer --GreenZipTie. After futzing with binoculars and whatnot, we got something from an LED light, close up, and then a sodium light spectra that was very shaky. Shaky Sodium, from handheld positioning. We had been using the boom mic stand to point the spectrometer steadily, but did not repeat this when we moved closer to the refinery, due to limitations on our battery time. 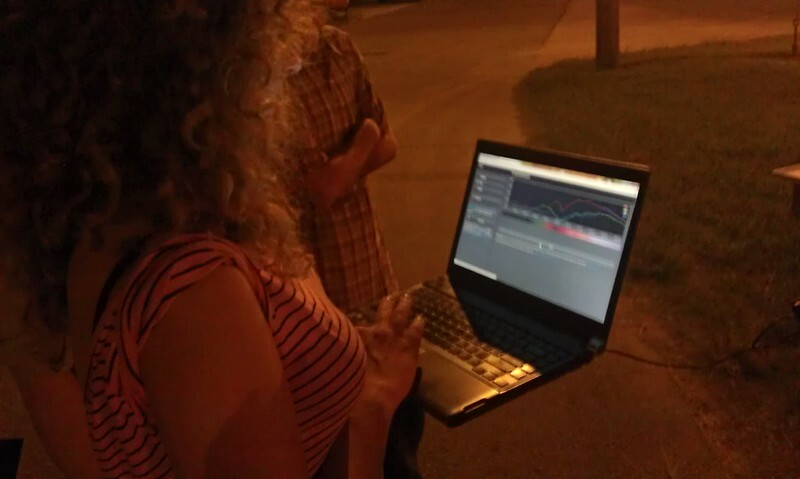 Although we got some signals, It was unclear what we were looking at, and the spectra was unsteady. With Amber from NASA-DEVELOP, a handful of us met again in Chalmette on Mary Ann Ave, and looked at a flare there that was 600-700 feet away. It was Scott, Dan, Shannon, and Matt Toups. Using the same green zip tie spectrometer, with no black cardboard, we received two spectra at once. The bottom spectra corresponded to the bottom light, and the top spectra flickered in intensity, telling us that the spectra was the spectra was the flare. We used the boom mic stand; this is the first time we have mounted the spectrometer without the slit paper on the mic stand. It worked like a charm, and we got two signals on the same panel, but they were separated, as described in this video. In this video, I describe taking multple spectra at once, from having two spectral workbench tabs open. Below are links to the two spectra. The sodium light, 10 m away. This spectrum is clipped. We then used Dan's black cloth to make the signal more coherent. Here is a link to the spectra collected with the black cover. Can we use the spectrometer at a distance? Yes we can. But there are challenges, the biggest being holding the spectrometer steady. Very precise adjustments of the boom mic stand were necessary. Capturing spectra at night may not be necessary, but it seems easier to me. Nighttime is also when the refineries tend to flare. Initially, I was worried that the light from a flare at distance would not be intense enough to give good lines for the camera; I have learned that it is more about the precision of the aim of the instrument. But, now that we know that it is possible, I will consider replacing the black slit on the spectrometer, to capture flares spectra with less glare. We should keep in mind that this flare was a "resting" flare--that is, more than a "pilot light," but not polluting enough to be picked up on the VIIRS system or to be reportable to the National Response Center. The reader should also keep in mind that GreenZipTie was a hastily built spectrometer. I built it; I know pretty much nothing about optics, and did not improve upon the spectrometer design in ways that smarter people have done and suggested I do. There are many improvements to the basic spectrometer design, which can improve the signal of capture. Is the calibration for green zip tie spectrometer hold, even if we calibrated it with the black cardboard slit in place? Is the boom stand precise enough to capture a spectra with the slit in place? Exciting and promising work! There must be some great techniques from surveying that can be applied here for the precision targeting.